How does one make a seven and a five year old sit still for a world history lesson? By promising a craft to follow! That’s what I had to do when I gave a lesson on the correlation between religion and history this week. I tried my best to repeatedly explain that if it were not for the ancient Egyptian’s beliefs the great pyramids still standing today would not even exist, but the eyes moving around the room and the involuntary wiggles were telling me that the craft was much more important than my words. My girls may not remember that people’s choices are driven by their personal beliefs and religion, thus effecting our world history, but they will remember what a pyramid is and how to build one! Good thing I had something prepared in advance. Yes the day before I had printed out a template for a paper pyramid I had found online and used it to cut out a sturdy piece of recycled cardboard. I then took painful care to cut that out and proceeded to use a ruler to guide my bends in all the needed places. All that was left then was to secure my pyramid in place with duct tape and clean up my giant mess. This preassembled beauty would have to wait overnight for eager hands to decorate it. The following day after my semi – successful verbal history lesson I gave each of my girls their own paper templates. I also placed my own pre assembled paper pyramid out on the table for them to study. At this point I hadn’t even pulled out the preassembled cardboard pyramid because I first I wanted to give them an opportunity to develop their critical thinking skills. My husband and I are firm believers in molding these skills. Rather than tell them how to do it, I simply said, “There is a way to cut, fold, and tape this together into a pyramid like Mommy’s. Try and put yours together by yourself.” My seven year old figured it out single handedly in minutes. My five year old got very far by herself as well, but needed a little guidance in understanding the flaps along the sides of each triangular wall. They finished and we put all three paper pyramids side by side and relished in our success! Now came the fun part. I whipped out the preassembled cardboard pyramid and explained to the girls that if it were a real pyramid it would be out in the desert and covered in sand. They knew what to do and were already getting their hands dirty before I had finished speaking. By the way this is and OUTDOOR project for those of you who may want to try it. 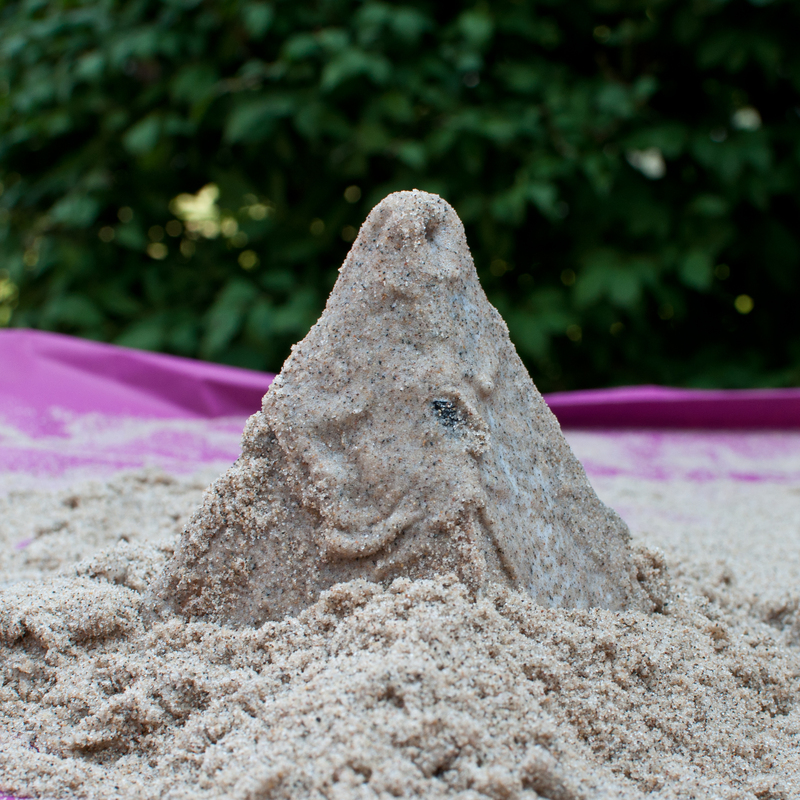 I gave each of the girls, even my two year old who quite enjoyed herself, a sponge brush and a cup of glue and instructed them to cover the pyramid all over. They did so in a blink. The next step needed no instruction, they got good and dirty dousing the now sticky pyramid all over with sand. Far more sand than needed at that. I was so glad that we just happened to go to the beach over the weekend so that I could collect some. Of course I could have just as easily taken it out of their sandbox as well. That was that. The pyramid was very realistic looking just small. I made a point to ask the girls how big we would be standing next to our sandy pyramid and they agreed that we would be as tiny as ants. Great! They get it. In fact my five year old insists that we go to Egypt and see the real ones. What could I say? Maybe someday . . .